2009 marked the 60th Anniversary of People’s Republic of China (PRC). What better than a Leica MP Limited Edition Camera coated in gold to celebrate the occasion? 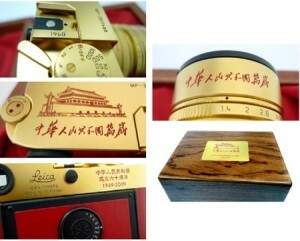 Exclusively sold in China, each set is a mere 199,900 Chinese Yuan (US$29,284).